i love this kind of ‘snow’! It has the advantage of not having to feel cold to enjoy it. While I’ve seen plenty of cattail fluff, I’ve never seen it this prolific. Texas does everything in a big way, right? The experience was magical. I’ll bet you’ve photographed your share of cattails. Some…they were prevalent in SC and I see them occasionally on the west coast. I seem to recall seeing some at the edge of San Francisco Bay near Berkeley. When I saw the word snow, and glanced at the first photo, I thought of the ‘snow’ that used to be part of the television viewing experience. I’ve seen plenty of that kind of snow in my time, but I’ve never seen anything like that combination fluff in your first photo. I wonder if anyone ever used cattail fluff as artificial snow for Christmas trees? It would be a mess to clean up, but I think it would look great. I am sure it would look great. This coming December you can try out your idea and let us know how well it works, and also how long it takes you to vacuum up the seeds and fluff. 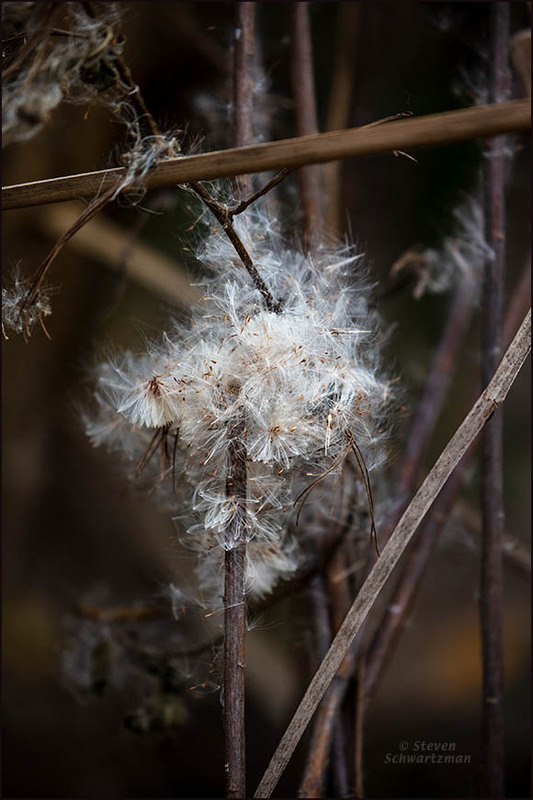 While I’d seen cattail fluff and goldenrod fluff many times, this is the first instance I recall of the two together. The cattail fluff predominated. Not for a long time have I thought of 1950s-style television snow. What a long way we’ve come in one lifetime. It does. It’s the closest thing to snow we’ve had here this year. To the tune of Good King Wenceslas; Good man Steven look-ed out, on the walk of Arbor, when the fluff lay all around like a snowy wondor. “The walk of Arbor” seems more poetic than “The Arbor Walk.” I appreciate your ennobling it and turning it into song. On December 3rd that song (the original, at least) would already have been making its seasonal rounds, just as I was making my photographic rounds. I thought it was frost at first. That is some cattail seed frosting! Beautiful photo, Steve. You raise the intriguing possibility that on a cold morning I might have been able to add actual frost to the “frosting” of seed fluff. Those make a horrible mess if run over by a lawn mower. The last time it happened, the kid who ran it over did not know what it was, and was really bothered by it. It looked like he ran over a teddy bear. Nonetheless, cat tail happens to be my preferred choice for the official town flower of Los Gatos. Somehow I get the impression that cattails and lawnmowers didn’t evolve in the same era. While the sloping banks of the Arbor Walk Pond do unfortunately get mowed—too often, and killing off too many native plants—the area shown in these two photographs is marshy and seems too rough for mowing. Hooray for small miracles. Los Gatos happens to be located where the Los Gatos Creek flows from the Santa Cruz Mountains into the Santa Clara Valley, so had been somewhat marshy. 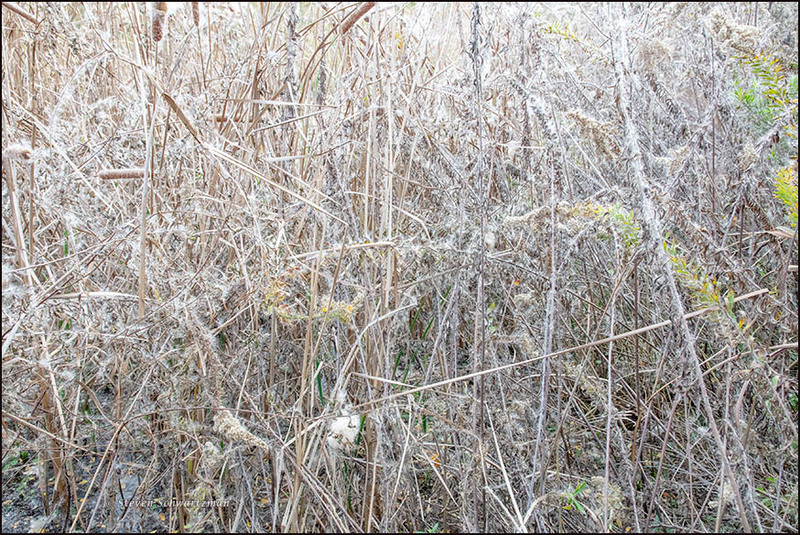 It is not like that now of course, but cat tails still live along the Los Gatos Creek and in Vasona Lake County Park, which became a park because it is too marshy to develop. I do not think of cat tails as native, but they are, so are qualified to be the official town flower. (Exotic specie must be of cultural significance to qualify for nomination as the town flower. Apricot blossom is another option.) I think they would be an excellent town flower for the ‘Kitty City’ of Los Gatos. As with grasses, most people don’t think of cattails as having flowers. They do, and they’re native. Cats—other than wildcats—aren’t native here. I’m guessing Los Gatos got named after mountain lions. That is the popular guess, but it is actually named for the bobcats. I do not think that cat tails would be the weirdest town flower. It is no worse than Eastern white pine being the state flower of Maine, and I even think it is better than mistletoe being the state flower of Oklahoma (That one is just odd.). I appreciate your singling out that picture, so different from the first. I was tempted to call the darker one Rembrandtian. We have a similar effect springtime from cottonwood trees. Despite the distance between here and where you are, I’ve seen that springtime effect because cottonwood trees also grow in Austin. My first look definitely registered snow, Steve, so I was glad to read on. I love seeing what the cattail fluff dispersal turned into. Nice series, thank you. You’re welcome. Maybe I should have chosen a neutral title and asked people what they thought they were looking at in the first photograph. Even with the give-away title, you registered snow. Another commenter saw frost. Now if I can just get a little real snow, I’ll be happy. It happens in Austin on average once every five years or so. Well, your phrase and a perfectly poetic one.